Although the SEO optimization of your website can be complex and sometimes difficult to understand, it remains an important factor in your Internet success. In fact, it’s not because you publish your site on the web that it automatically end up at the top of the results in the search engines such as Google, Bing, Yahoo, etc. 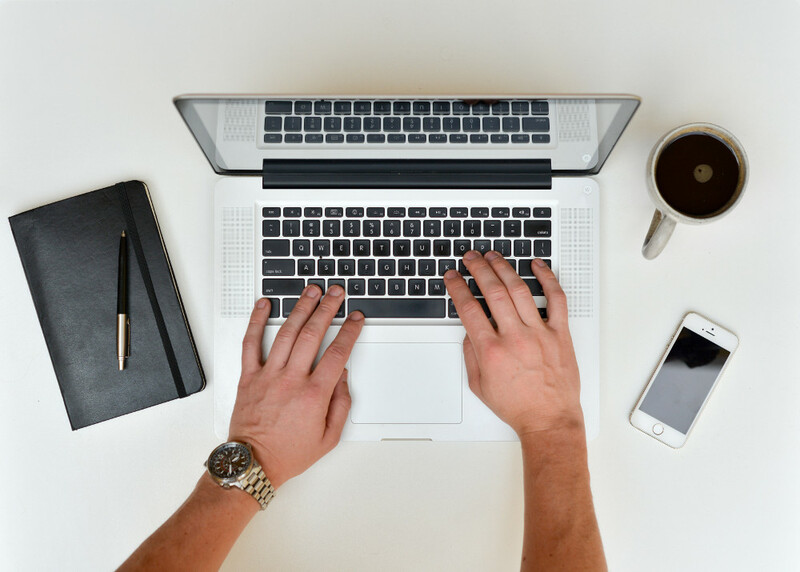 But we’ve got good news for you: WebSelf found five practical tools to help you improve the SEO optimization of your site and how to maximize your success! 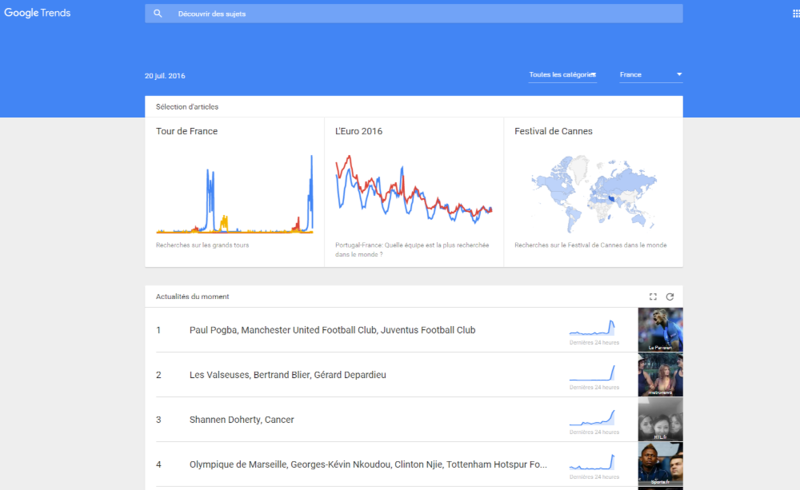 Google Trends is a free tool that can be very useful for the SEO of your website, especially when you are writing the texts. It's quite simple, you can search for keywords to see their popularity and frequency in the search engines. The tool also allows you to narrow down the results by region or language and it is updated daily. For example, following a high-profile event, we can see a big change in the results of certain words or research keywords. Knowing what the visitors of your website type when they search something on Google is a competitive advantage in terms of digital strategy. Determine exactly what your visitors type when searching on Google, according to geographic location and language. 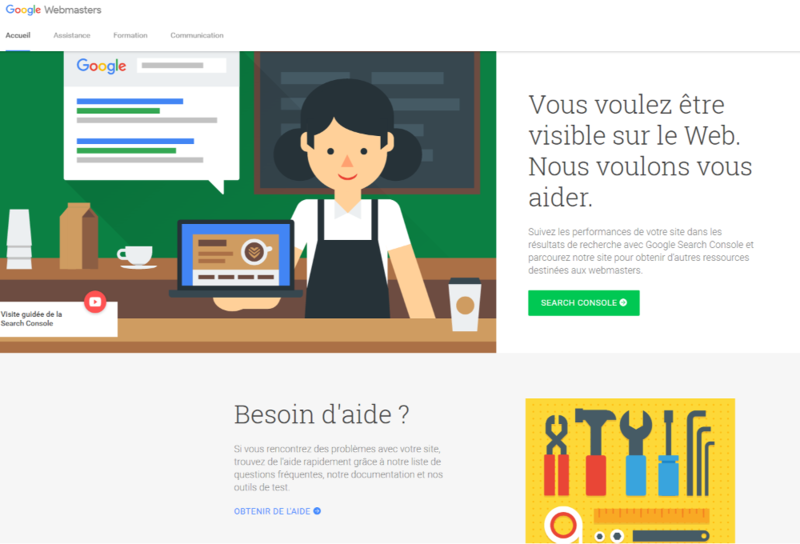 Google Webmaster Tools is a free tool available for all types of websites. When entering the domain name, Google will provide data, tools and statistics for the success of your website in terms of SEO. This tool will help you better understand how the robots of the search engine see your site, where you appear on the search results pages, how your audience interact, but also what problems were detected. These problems can be errors achieved by robots, links that do not work or copied content, for example. Once you have all the necessary tools to optimize the SEO of your website, it is good to follow its position on the search engines. Myposeo tracks your keywords based on your domain name. 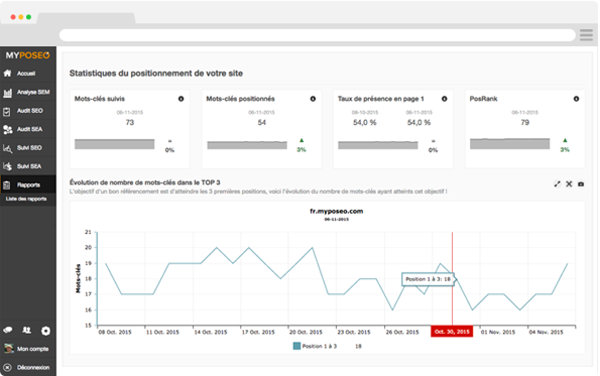 With this tool, you will have the chance to compare your positioning on several search engines, but also with your competitors, in addition to obtaining important data, such as charts of the evolution of your position, the competitor’s website who holds the top spot and the search volume in terms of your keywords. 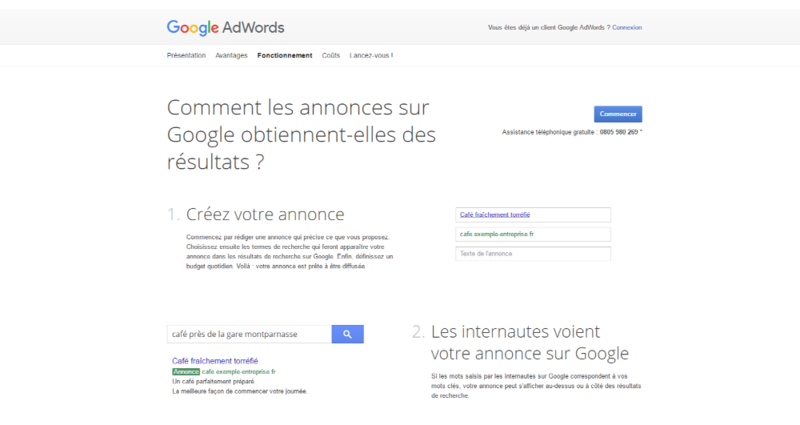 Another useful tool is to be aware of is AdWords, Google's advertising system. It will display text, images or video ads on the search engines as well as on partner sites. As an advertiser, you are charged only when a visitor clicks on your ad in an auction system for each keyword. It is also possible to create an advertising campaign that directly reaches a predetermined age according to categories such as language, gender and age of the audience you wish to target. While AdWords may be essential to your business, it is a bit complex. Thankfully, there is a simpler tool for you: AdWords Express. With AdWords Express, you can create ad campaigns on Google and you pay only according to the results, without any additional costs. Just select a budget for your ad, and you have the option to change it, pause or delete the broadcast at any moment! And finally, the new free tool “WebSelf SEO,” which has recently become available in your dashboard, is simple to use for those who aren’t SEO optimization experts yet. This analysis tool is based on SEO elements related to the structure of your site as the title tags, keywords, Meta descriptions, etc. Using visual cues (a green X or a red hook), you will see what elements to improve or add and you can do it directly from the editor. By making these small changes, you will improve your ranking on search engines. 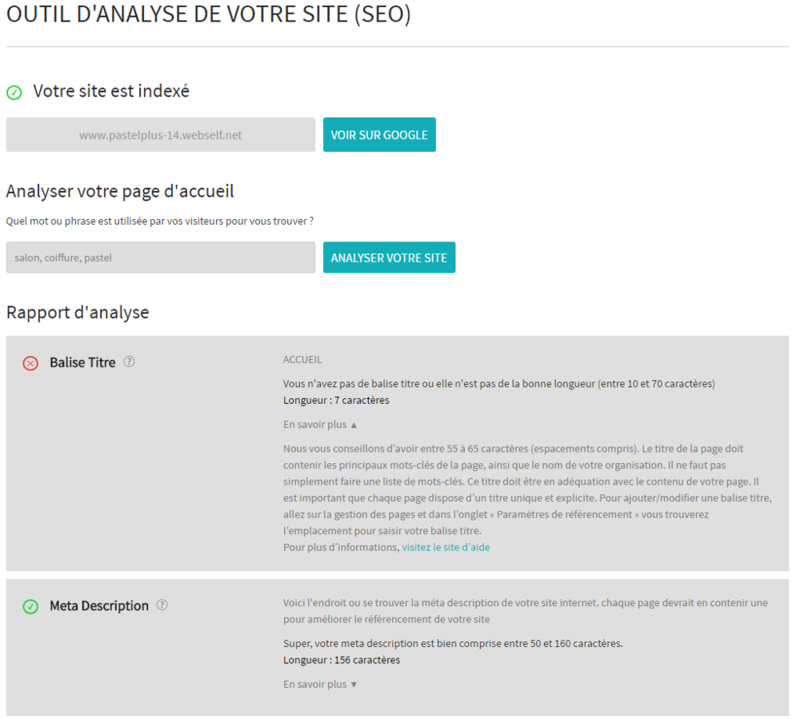 Note that the normal waiting time is between one and two weeks before your site will be indexed, therefore referenced. Everything is easily accessible from your dashboard.